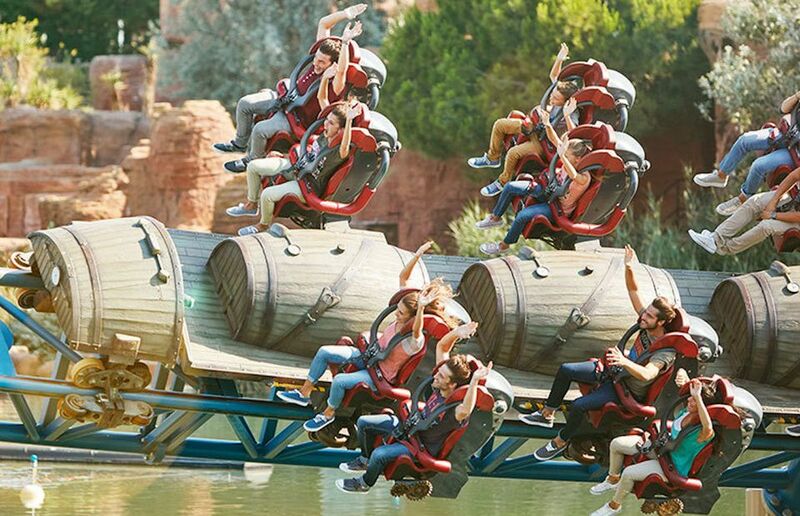 Could You Handle Furius Baco at Spain's PortAventura? This is not your padre's roller coaster. Catapulted out of the station at a face-melting 0 to 84 mph in 3.5 seconds, Furius Baco takes control and never lets up. Designed for speed—and nothing but speed—the coaster makes one giant loop around the Mediterrania section of PortAventura. With no hills and virtually no elements, save one twist, to slow its momentum, the ride maintains its insane speed until its brakes mercifully slow it down just before it returns to the station. No inversions, but incredible speed and extreme positive g-forces. As one of the world's fastest coasters, the speed is about as intense as it gets. There are many other launched coasters, but none quite like the hill-less Furius Baco. One look at its trains gives a sense of the unique ride. Instead of sitting on top of their chassis, the wing coaster seats are positioned to the sides of the track. Each row of four seats has two on the left side of the train and two on the right. The ride, therefore, leaves riders' feet dangling with nothing beneath them. The arrangement is similar to fourth-dimension coasters such as X2 at Six Flags Magic Mountain, but unlike those rides, the seats do not spin independent of the train. In the middle of the train are wooden barrels—presumably wine barrels. ("Baco" is the Spanish word for Bacchus, the god of the grape harvest.) While it is unclear what the ride is supposed to be about, there is a curious pre-show in which an animatronic monkey pedals across a tightrope and disrupts a machine in a factory (a winemaking plant, perhaps?). The ride designers who came up with the brief show may have imbibed a bit too much vino. Once the monkey causes his mayhem, the trains tear out of the station. The launch is incredibly intense. Reaching 84 mph in mere seconds, riders are pinned to the seats by powerful positive Gs. Instead of scaling a top-hat hill like the hydraulically launched coaster, Kingda Ka—or any hill for that matter—Furius Baco drops into a shallow trench. Whizzing past the sides of the trench makes the speed seem that much more intense. The coaster then enters a short aboveground tunnel for a brief moment of darkness. The train banks to the left and continues banking into an in-line twist (essentially a corkscrew inversion). With no trim brakes and nothing to check its speed, taking that twist at such a breakneck pace is wild and disorienting. When the train rights itself, and riders regain their bearings, it soars down to nearly skim along the picturesque "port" of Mediterranea, a nice touch for the feet-dangling riders. And...that's it. There is a little turn into the brake section and a return to the loading station. The time of the ride is listed as 55 seconds, but that must includes the silly pre-show. The actual ride time is probably closer to 30 seconds. But what a 30 seconds! For fans who crave speed, Furius Baco is like the wine of the coaster gods.